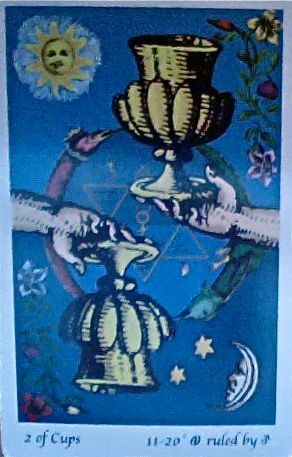 Weekend Reading: Two of Cups from the Tarot of the Holy Light. This weekend grab ahold of someone who complements you. When those of complementary gifts come together, great things can happen. If you're coupled, acknowledge and honor those parts of each of you that are unlike your partner. If you're single, keep an eye out for someone who complements you. The focus is on love this weekend...finding it, keeping it and making it.